BB Chronological 19: BB #3 – Third Time’s The Charm! With the third issue of Big Bang Comics published under the Image Comics banner, I thought that we were really on a roll. Ultiman and Thunder Girl made their debut at Image, and our flagship character the Knight Watchman was back for his third consecutive issue. Big Bang was essentially an anthology series, featuring different characters in every issue because frankly, it wasn’t making enough money to support any of us. Orders for the book on the direct market had improved over what we had been doing at Caliber, but they weren’t really that great for an Image title. 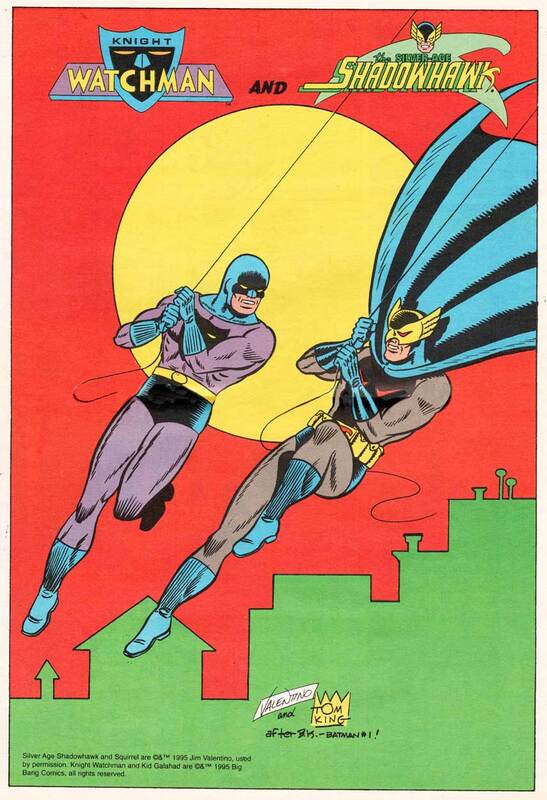 Therefore, we were making sure that the Knight Watchman was a constant presence so fans would find a familiar face in each issue and keep coming back. 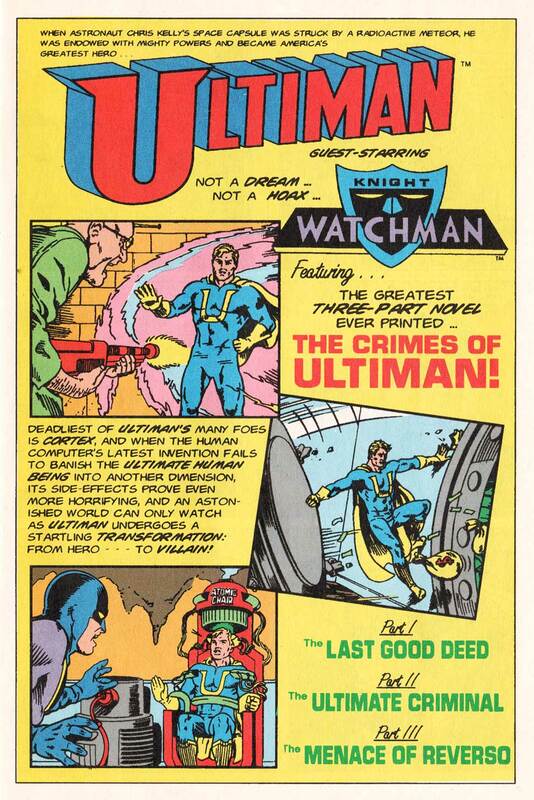 This issue’s main story, “The Ultimate Criminal” was a Silver Age World’s Finest type story featuring Ultiman and the Knight Watchman (known to us at Big Bang as the World’s Best Friends). From the very beginning, we made no bones about the characters being homages and we definitely weren’t making fun of how stupid the old stories may have been. Hopefully the love showed. I wasn’t reinventing Superman or trying to rip him off. The similarities were obvious. It was the differences that we were proud of. We always called it “taking a left hand turn” from the actual characters. 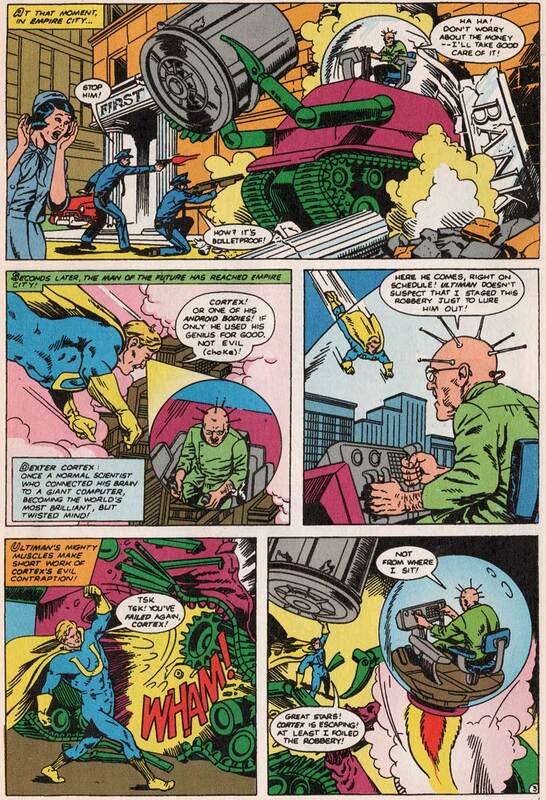 Villain Dexter Cortex was something of a combination of Lex Luther and Brainiac, a man who hard-wired his brain into a computer to outsmart Ultiman. The other villain, Reverso escaped from a mirror-image world where everything was opposite. Where Ultiman was good, his doppelganger was evil. For a while, even Ultiman thought he was committing crimes that he couldn’t remember under some evil influence, until the Knight Watchman turned up to help. Reverso was definitely a nod to Bizarro – the dialogue in his word balloons was reversed (not actually backwards typeface but the words were in reverse order: YOU I LOVE instead of I LOVE YOU). There were lots of “twists” in the mythos. Ultiman’s Secret Citadel was in a live fiery volcano. U-Man’s secretary Lori Lake was in love with him ( astronaut turned super hero Chris Kelly), but detested his “brother” Carl who was something of a jerk. Of course, Carl was Ultiman’s alter-ego. Carl really had been Ultiman’s brother, but when he perished in an as yet unpublished story, Chris decided to adopt his bad-boy brother’s persona to get a break from being Ultiman all the time, and to get an “in” with the more unsavory element of civilization, a la Matches Malone. 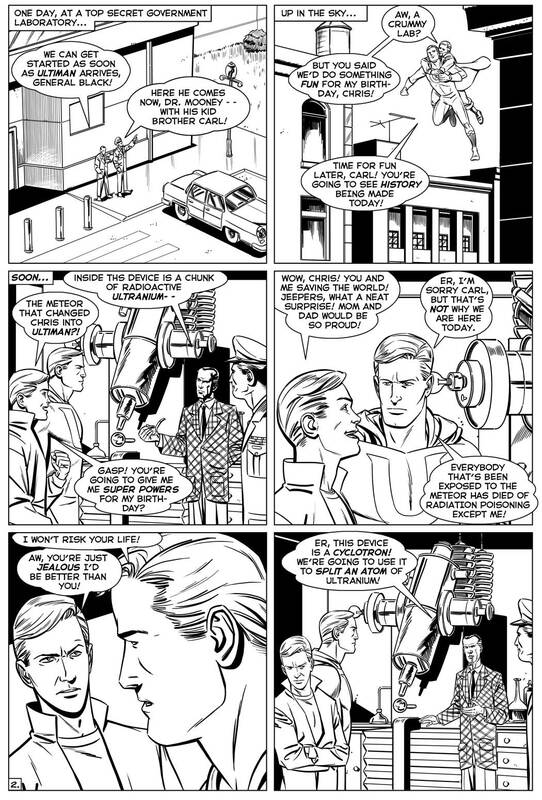 Just a heads up – – the real Carl Kelly will finally be making an appearance in comics in May 2017, in the pages of “Ultiman of the Atom” in Big Bang Universe #3 from AC Comics, written by me with art by Joe & Rob Sharp on Chapter 1 (and Tim Stiles in Chapters 2 and 3).. I loved (and still do) the classic Superman stories and had a blast writing this one and creating the mythology of Ultiman. What made it even more special for me was the art by Jeff Weigel. 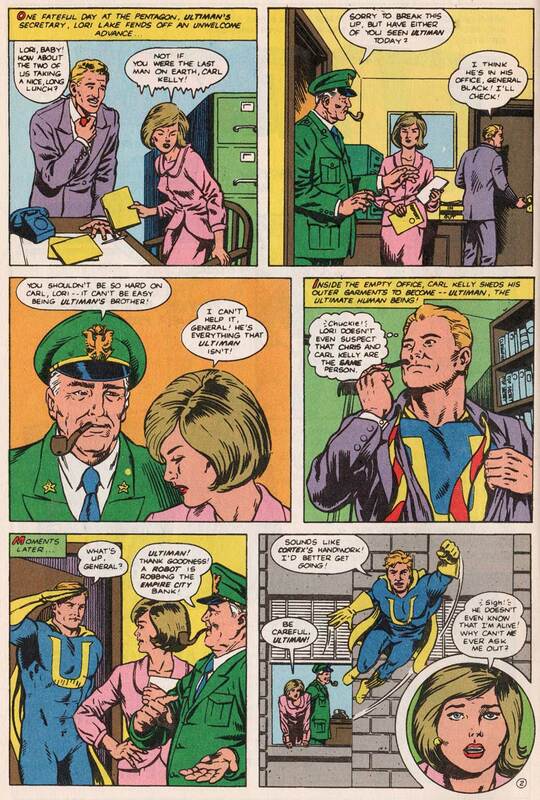 I had met Jeff at the Chicago ComiCon, and when he showed me his samples I jumped up saying “This looks like Curt Swan inked by Murphy Anderson!” He backed away saying “Yeah, that’s what everyone says.” Curt was a dinosaur at the time, having been shunted aside by DC in favor of John Byrne and the other new guys on Superman. I showed Jeff what we were doing with Big Bang and eventually convinced him we weren’t just trying to rip off DC. Jeff penciled the front cover, which was inked by Andrew Pepoy, and also penciled the main story, which had inks by Ed Quinby. 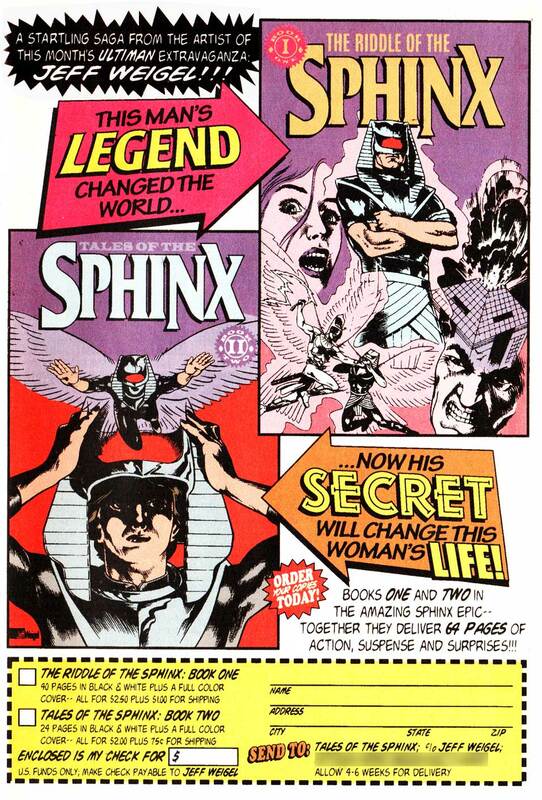 The issue even had an ad for the two self-published issues of Jeff’s own character, the Sphinx, who eventually joined the Big Bang Universe a few issues later. Big Bang #3 also featured a two page centerfold pin-up of the Knight Watchman and Silver-Age Shadowhawk penciled by Jim Valentino and inked by Chris Ecker, done prior to the “Angry Red Aliens” story from issue #2. 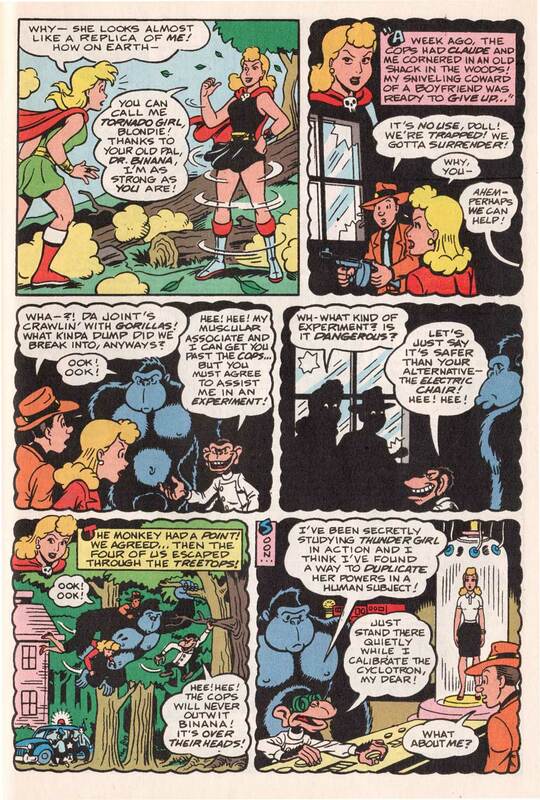 This was followed by a Superswine one-pager by Gary Fields, and ended with “Thunder Girl Meets Her Evil Imitator!” written and drawn by the wonderful Bill Fugate. Bill was as great a writer as he was a cartoonist, and I would’ve been jealous to be so easily replaced on my own character’s story if I hadn’t loved his work so much. In this tale, that nefarious chimp Dr. Binana builds a machine that can duplicate the World’s Strongest Girl’s powers. He then bestows them upon the criminal Bad Penny (one half of the crime duo Penny and Claude), turning her into Tornado Girl. 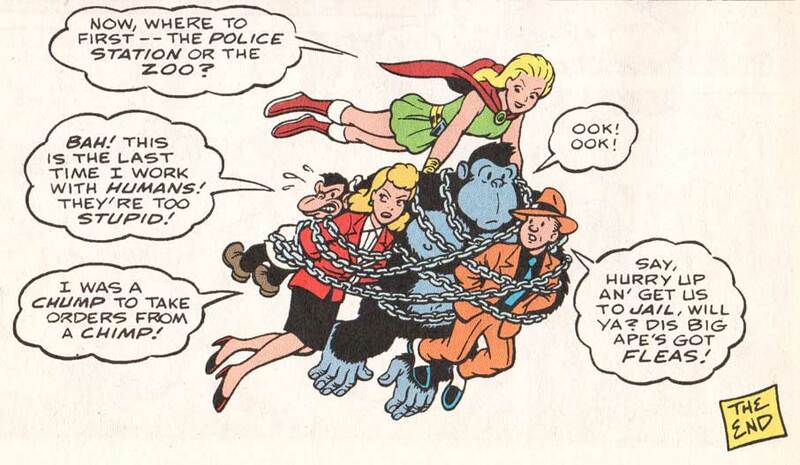 Luckily, Thunder Girl prevails and carries the criminals off to their just rewards. Classic Big Bang from cover to cover.